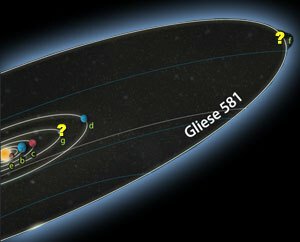 Gliese 581 is a red dwarf star with 6 planets, two of which happen to fall within the star’s habitable zone. At least that was one possible conclusion. The 6-planet solution to the data is actually a bit controversial, and other astronomers preferred a 4-planet solution. 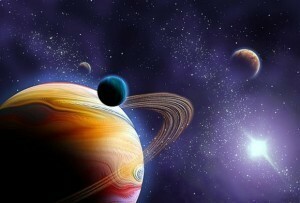 The difficulty in determining the number of planets is due to the challenge of finding the signal in the noise. The planets for Gliese 581 are found from the Doppler shift method. Astronomers observe the star over time, and measure the Doppler shift of the star’s spectral lines. Since Doppler shift can occur as a star wobbles toward us and away from us due to the gravitational pull of a planet, we can measure the Doppler shift to find planets. The problem is that stellar wobble isn’t the only way Doppler shifts can occur. The surface of the star can shift up or down due to stellar activity, and this can look similar to planet-induced wobble. This is particularly true for close orbiting planets with an orbital period on the order of days. But for red dwarfs this effect is generally thought to be small. Now a new paper in Science has found that magnetic fields are another effect to be worried about. Magnetic fields can generate solar activity such as starspots (sunspots on other stars) and can affect the spectral lines of stars. The authors looked at a different region of the stellar spectrum and measured the rotation rate of the star. They also found evidence of magnetic activity, which correlates to starspots and the like. When they incorporated this new data into the spectral analysis of the 6-planet solution, they found that the signal 3 of the planets washed out. Two of those planets were habitable candidates. So it now looks like a 3-planet solution is the best fit to the data. This new work actually demonstrates how we need to be careful about cutting-edge research such as exoplanets. 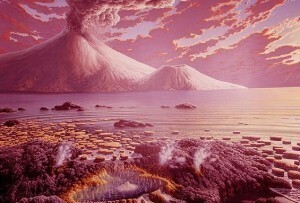 When new exoplanets are discovered, they are often portrayed as rich worlds with detailed terrain and watery coastlines. In reality the evidence for these planets is seen in the slight shift of spectral lines, or tiny variations in stellar brightness. Finding exoplanets is difficult, so we should expect that some discoveries will be invalidated with further evidence.